Given the complex history of this time of year – in Scotland, especially – the Midwinter period tends to be one long festive season with a few especially important days that have certain traditions clustered around them. Since Christmas day, falling on the 25th, is technically the “fixed” date of the solstice (or it was, historically), Yule customs may be observed for Christmas itself or on the date of the solstice proper (i.e. the movable date, when the solstice actually occurs). 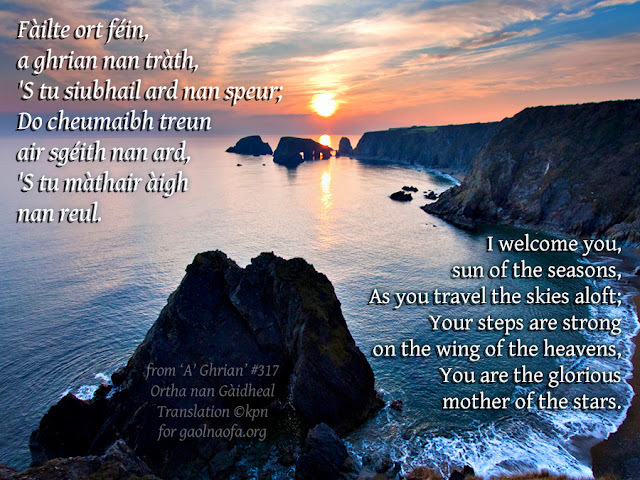 Some Gaelic Polytheists may observe the solstice with their own traditions – welcoming the return of the strengthening sun and lengthening days that will lift us from the dark and cold – and then mark Christmas in a secular sense, since they want to share in the traditions they were brought up with (or perhaps married into) with their loved ones. Others may prefer not to celebrate Christmas – or the solstice – at all. In my household, we celebrate the solstice on the actual day in a low key sort of way (lighting a candle or two in the window, having a wee feast and then greeting the sun in the morning), and then we mark Christmas as a secular day shared with family and loved ones. Our main focus for the season is on Hogmanay, though, since it’s pretty much the most festive occasion in the Scottish calendar there is, and that’s what I pour my energies into in terms of getting the house ‘redded’ (clean, tidied and all in order). Your mileage may vary, though. You might want to go all out for the solstice, or Hogmanay, or both. It’s entirely up to you. Clean and tidy the house so it’s all in order, and make sure any items that have been borrowed are returned. Take the opportunity to fix anything around the house that needs fixing (if you can), and make sure your cupboards are well-stocked. Decorate the house with festive greenery – firs, holly, etc. On the night of the solstice itself you can set a piece of rowan above the lintel for protection (since it’s one of those nights when all kind of mischievous or malevolent spirits may be afoot). In some parts of Scotland seaweed may be used instead of rowan! At this time of year there’s plenty washed up on the beach. Get a Yule kebbuck – a special cheese flavoured with caraway seed. Bake some Yule bannocks. These are traditionally an oat variety (which would have made a change from the more usual barley variety in the very northern-most parts of Scotland), and they can be baked with an equal-armed crossed incised into them “to represent the returning sun.” It’s traditional to bake these the night before, and they can be given to each member of the household who must look after them until breakfast the next day. Any bannocks that break are meant to be a bad sign for the person who’s supposed to be looking after them. As it begins to get dark on the solstice night, the youngest member of the household can light a candle, which may be set in a window (very young children will need help to do this). In our house the kids both light a candle so they don’t feel left out. In some households, this tradition may fall to the youngest daughter, specifically. Candles may also be lit to commemmorate any loved ones who’ve died in the past year. The candles should – ideally – be left burning until the morning. You can stay up and make a vigil of it, if possible. If you can’t keep the candles burning overnight safely, please don’t! Aside from the candles, the bloc na Nollaig or Cailleach Nollaig can be burned in the fire. This is traditionally a large log (even a tree stump) that’s brought in specially. The aim is to make sure it keeps burning for the whole night until daybreak; if it goes out, it may be taken as an ill omen for the household in the coming year. Catching sight of the new moon at Yule is an especially good omen. (Yule good and Yule food/Follow you through the year! – I.e May you be blessed with plenty of good and plenty of food in the coming year). A cold and snowy morning traditionally indicates a mild spring to come, while a mild and green morning indicates a harsh winter and spring ahead (this may, of course, not be applicable in your bioregion). 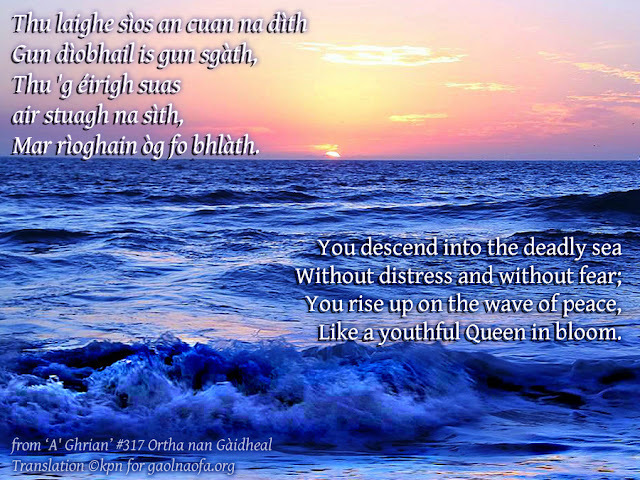 As you go outside to take any omens, you may greet the sun with a traditional prayer. The bannocks and cheese may then be eaten as part of a hearty breakfast.